Apartment 528: Paying too Much? I was reading GadgetCrave.com when I came across a post about Rentometer.com. The headline was "Rentometer: Are you paying too much rent?" How could I not click on that!? 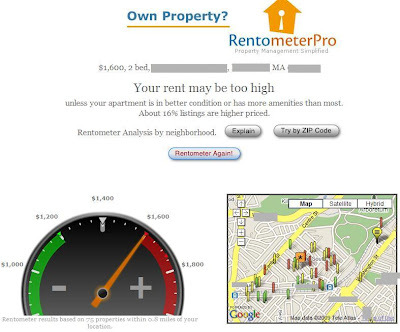 Rentometer.com is a tool for both landlords and renters to use to decide whether their rent is too low or too high. It could come in handy when it's time to renew your lease. When you go to Rentometer.com they'll ask whether you're a tenant or landlord, your address, how much you're paying, and how many bedrooms your apartment has. The Rentometer then takes that information and calculates the average rent in your area for an apartment of your size. A meter will come up showing you where your rent figures in. Next to it, you'll see a color coded map of your neighborhood with spikes that show where the rent is high (red), low (green), or just right (yellow). Keep in mind, that the Rentometer doesn't take into account amenities, great views, or other things that can cause rents to be higher than usual. For example, my rent is listed as high. Only 16% of the apartments in my area are more expensive than mine. Of course, that doesn't take into account the renovated kitchen and baths, the large master suite, the in-unit laundry hookups, or the driveway parking. All of those things factor in to drive the rent a little higher than it normally would be. If you check the rentometer and see your rent is too high and that you're not getting many amenities, I'd use the rentometer results as a starting point to negotiate the rent a little lower. Of course, if you come out on the low end, be glad you're getting such a great deal! my rent is just right! This is so cool!!! Apparently, all my Boston apts have been pretty good deals. I just wish you could also factor in whether heat was included or not since that makes a huge difference in the NE. Apparently I pay too much. I wish I knew about this tool before I signed on.